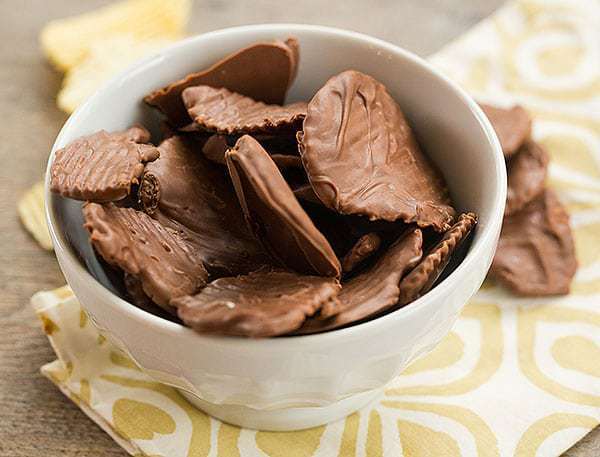 I fully admit that for years and years and years, the mere thought of chocolate-covered potato chips sounded absolutely disgusting to me. While I love the sweet and salty combination of chocolate-covered pretzels (one of my biggest weaknesses), I just couldn’t see how chocolate and potato chips would taste good. Then, a couple of years ago, my Chief Culinary Consultant and I took a little road trip and went on a factory tour at Utz. After the tour, we ransacked the factory tour and bought a ton of goodies. One of the things my CCC threw into our cart was a box of chocolate-covered potato chips. I still didn’t think I’d like them, but on the drive back home later that night, I was hungry, wanting a snack, and those chocolate-covered potato chips were the easiest thing to reach in the car. So, I tried one. Hmm, not bad. Then, I ate another one… and another… and another… and, well, they totally changed my mind when it came to chocolate-covered potato chips. As it turns out, sweet and salty are ALWAYS a good thing. This year, I decided to add homemade chocolate-covered potato chips to my baking list, and they’ve been a big hit everywhere I’ve taken them. It seems that most everyone is a big fan of the sweet and salty combo! This is a super easy recipe to make and you can switch it up however you’d like. 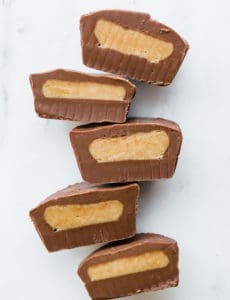 I prefer using the thick ridged potato chips since they hold up well to the coating of chocolate, but you could certainly use your favorite chips. Likewise with the chocolate – I like milk chocolate for the sweetness, but you could just as easily use semisweet or dark chocolate if you prefer. 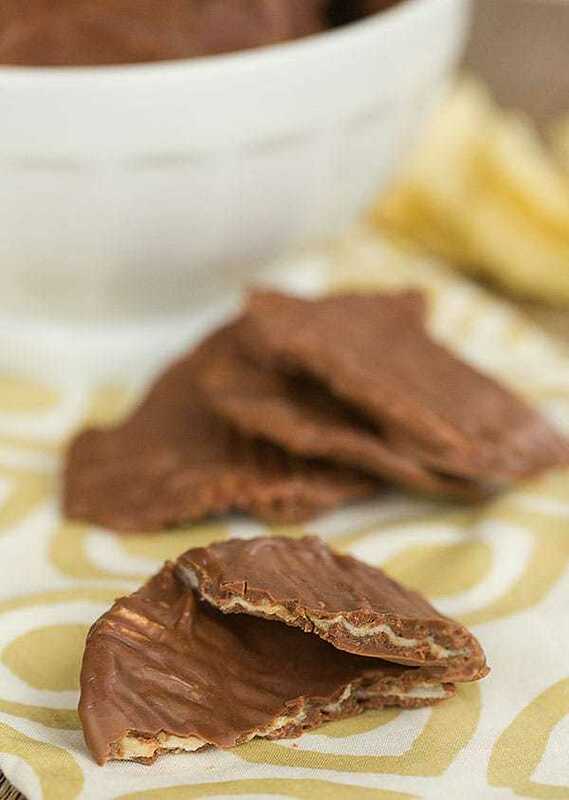 If you’re like me and had been on the fence about chocolate-covered potato chips, but love sweet and salty treats, make a quick batch of these and I promise you’ll be sold! A totally surprising sweet and salty treat. In a medium heatproof bowl set over a small saucepan of barely simmering water, combine the chocolate chips and vegetable shortening, stirring occasionally, until completely melted and smooth. Drop a few potato chips at a time into the bowl and, using two forks, flip the potato chips over so they are completely coated in chocolate. Lift out of the chocolate, allowing any excess to drip back into the bowl, and place on the lined baking sheets. Repeat until you have used up all of the potato chips and/or chocolate. Allow to set at room temperature until the chocolate is firm, about 2 hours. Note: You can scale this recipe up or down to make as many chocolate-covered potato chips as you'd like! Absolutely PERFECT! I also used dark chocolate chips and it was great also! I have been experimenting with chocolate covered potato chip recipes for awhile now trying to replicate, (as close as I can) the taste of the bagged Lay’s chocolate covered potato chips. If able- could you let me know if this recipe is similar in taste to Lay’s CCPC? Thank you! Chocolate covered potato chips have been everywhere this year! There were fancy store bought ones around the office for the holiday but I’ve never thought to make them myself. I would love to try these with some candied nuts and white chocolate drizzle! 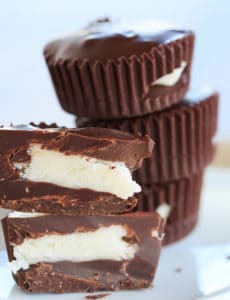 This post came a day after I had the idea of dipping potato chips in the extra chocolate I had from the chocolate covered Ritz Rolo sandwich “cookies” I made! What a coincidence! I love just about anything with that salty/sweet combo! Even if you are skeptical, try these! You will not be sorry!!! Merry Christmas!!!!!!! 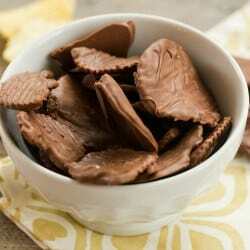 I love chocolate covered potato chips. My decadent little splurge. I love potato chips and chocolate, but I’m not really sold on the idea of combining them, but I do agree it’s worth a try. rest of the family tomorrow, thanks for the recipe. Oh my goodness, I need these in my life! I’ve never had chocolate and potato chips but it sounds divine. I’ve never heard of this before, but I do love potato chips and chocolate, so it seems like it’s worth a try. I didn’t think I would like them either and then I actually tasted them. So delicious! Love the thick layer of chocolate on these homemade version. Yum! Oh. My. God. I am SO going to do this tomorrow… I have friends round for drinks and nibbles and, whilst I know one or two of them are going to turn noses up, at least two or three are going to dive right in. Thinking I might try it with Kettle Chips … and definitely with dark chocolate instead of milk (just because I prefer dark!). 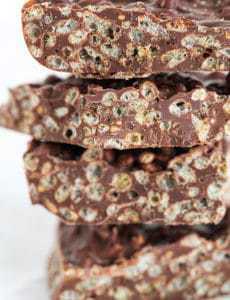 Have you ever tried a really good blue cheese (Stilton or Danish Blue, or Gorgonzola) with dark chocolate? Taste bud heaven!! All best wishes for Christmas and New Year. Admit it…..You’re Mrs. Claus leaving US treats! These look dangerously delicious! I adore salty and sweet combos, so I would probably love these (a little too much, lol). I have a slight modification to your reciepe that makes all the difference. Dip the chips only about 1/2 the length of the chip and sprinkle homemade bacon bits (Good Quality Bacon here, I make mine just a wee chewy) on the chip. It is a religious experience. All of the food flavours dance in your mouth, from smoky to crunchy, smooth to meaty, starchy to sweey…. You won’t be sorry. Very cool to make these yourself! So easy yet very impressive. local candy shop, Goumas Candyland. They are the best candy makers. was skeptical but once you try them look out! 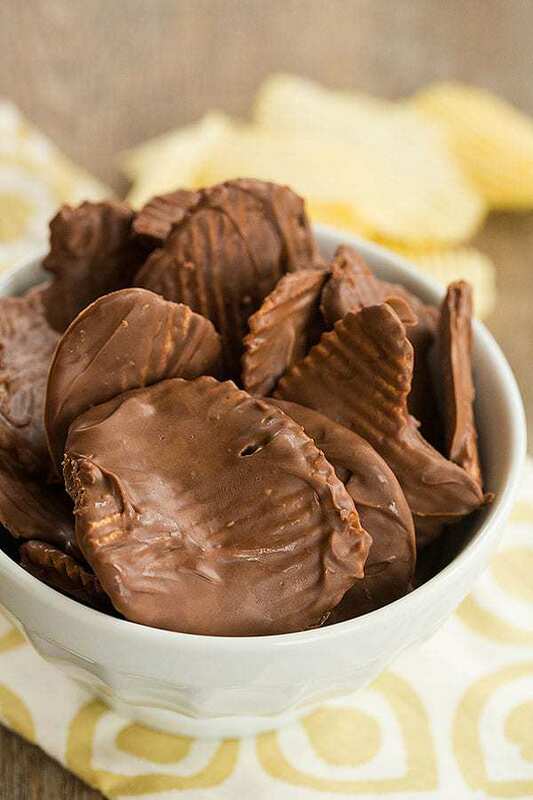 Chocolate covered potato chips are the BEST! I might even like them better than chocolate covered pretzels…so good! No words! Well, one! BRILLIANT! Salty, sweet … perfect!! I have never tasted this or heard of this combo but it looks and sounds scrumptious!